On the occasion of the first State of the Nation Address of President Benigno Simeon “Noynoy” C. Aquino III on the 26th of July, workers under the banner of the Alliance of Progressive Labor (APL) marched to Batasan to call on the president to unveil his government’s roadmap towards generating secure jobs for all. “The unprecedented high trust rating of President Aquino is a clear mandate for change – for good government and pro-poor policies,” Daniel L. Edralin, APL and LEARN Chairperson said. “As such, today we march with other progressive forces to ensure that the Aquino government will live up to its mandate,” he added. To lift large sections of the working class from poverty, the APL is urging the president to adopt the Labor Agenda, a set of policy reforms aimed at promoting full employment, increased social services and social protection, labor justice and strengthened protection of labor rights. “The only way to fight poverty is to end the unemployment crisis,” Daniel L. Edralin said. “Government needs to generate jobs, secure and quality jobs, jobs wherein workers’ and trade union rights are full respected,” he added. According to government statistics, as of April 2010, more than 3 million are unemployed and 6.3 million are underemployed. Addressing the plight of the unemployed and the underemployed – which comprise a quarter of the labor force – requires thoroughgoing reforms in the country’s trade, fiscal, monetary and investment policies. More importantly, it requires having a clear industrial policy. “To industrialize, we can no longer rely on the export-oriented policies of the past,” Edralin said. “We need to develop the domestic economy,” he added. It is for this reason that APL finds President Aquino’s 22-point marching orders for the Department of Labor and Employment (DOLE) short of what workers are expecting. At the same time, we cannot develop the economy without a firm commitment to adhere to basic workers’ and trade union rights. To signal its commitment to workers’ and trade union rights, the APL is calling on President Aquino to fully investigate the trade union killings perpetrated under the previous administration. “The climate of impunity must stop,” Edralin said. “It will, if we put to jail those who are responsible for the assassinations of trade unionists, activists and journalists, including the perpetrators of the Hacienda Luisita massacre,” Edralin added. The country is a signatory to ILO conventions, specifically Convention 87 or the Freedom of Association and Protection of the Right to Organize Convention. Pending before the ILO is ILO Case No. 2528, where a total of thirty-nine (39) cases of extrajudicial killings of trade union leaders, members, organizers and union supporters, and informal workers are alleged. The APL marched in the NCR, Cebu, Davao and General Santos. 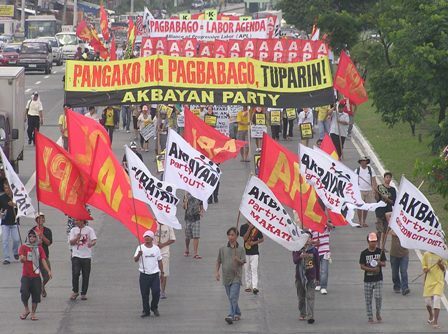 In the NCR, the APL, together with Akbayan, marched towards Batasan in the morning. 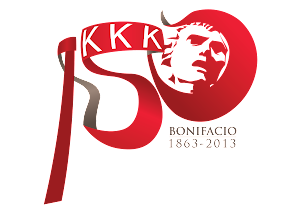 In the afternoon, APL linked up with the Kowalisyon Kontra Kontraktwalisasyon (KONTRA), Freedom from Debt Coalition (FDC), and Kampanya para sa Makataong Pamumuhay (KAMP).